Foliage: Ovate leaves 2" long. Water: Moderate. Perfers moist areas. Comments: Shrubby; often grown as shrub with multiple stems. Bark is shiny chestnut colored. 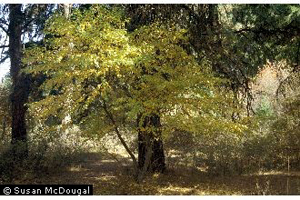 In the wild, often found with willows and cottonwoods in riparian areas. Dense root system. Good for streambank stabilization. Can be trained to be single stemmed for street tree. Warnings: Requires magnesium and calcium.